Sunday 8th July seemed just like every other day in July so far. The weather warm, muggy and in need of rain. The country increasingly wrapped up in the World Cup but enjoying a day of respite from being glued to the screen heart in mouth. 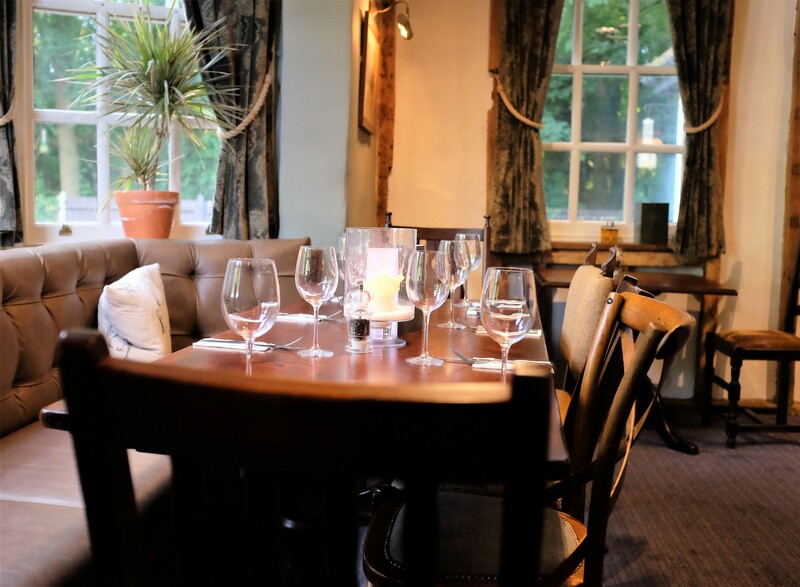 But for me the evening was still going to be full of delight and a new experience as I had arranged to go to The Fox at Coulsdon Common to see the new refurbishment and try out the menu. 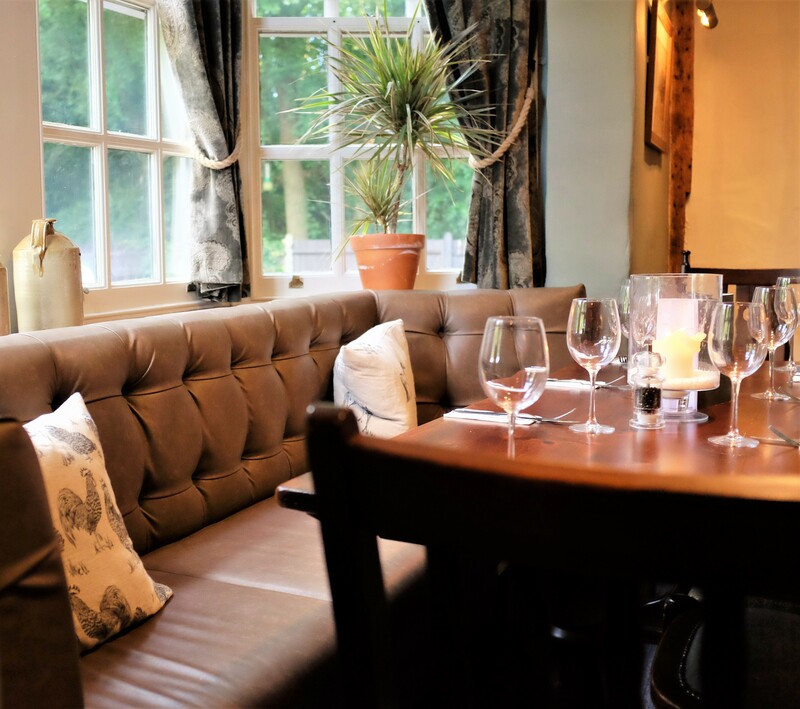 A couple of months ago the inn had gone through a refurbishment to change the size of the drinking area and the restaurant area as well as updating to the highest tier of the Vintage Inn menu. I was intrigued to find out if this walkers retreat, located amongst woodland and a common environmental natural spot enjoyed by many locals, in a quiet outer part of Croydon was deserving of such special treatment. On arrival at Coulsdon Common there was a a big signpost on the edge to encourage people to head down the road and inside a rather traditional looking standalone building for some light refreshments and a bite to eat. The sign had a well designed image of a fox on a grey background that gave the impression of a sophisticated, cared for and not just run of the mill boozer. It was a good start and we headed off down past the natural untamed common towards the secluded building. The number of cars outside showed the popularity of The Fox and taking a look around you can see a number of people scattered between the drinking area, the restaurant and the garden outside. Each area had been refurbished to the same level of standards, but with slightly different interior features, to create a cohesive and welcoming feel. Despite the number of people that I could spot having conversations I was surprised at how quiet the venue came across and it was clear the layout had been done in mind of tables being able to have privacy without conversations travelling throughout the place. We arrived ahead of our reservation time, partly because as people that live in Central Croydon with numerous buses and trams we have no need to drive and got the one bus that stopped close to The Fox, but they made the table up promptly and allowed us to sit down and commence our evening. On the walls close to our table there was a number of artwork that showed the outside of the pub as well as things that made reference to foxes, such as hunters, and it was all framed and hung in a way that gave a real ‘vintage’ feel. After looking at the drinks menu, which strangely had some items with prices attached but not others, and with the out of character British weather I decided that my drink would have to be a cool and refreshing one but I was not really feeling having any wine. 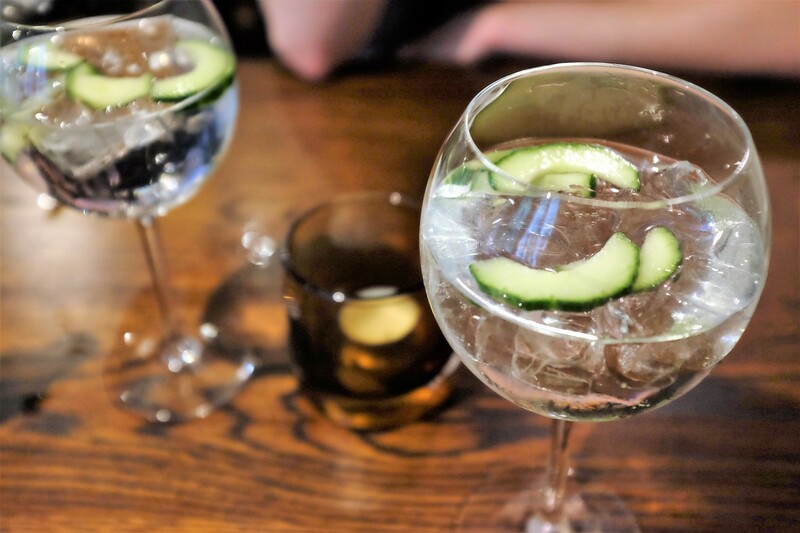 Much deliberation and pondering resulted in me selecting a pomegranate and elderflower gintonica which came with a lot of ice and cucumber to make it additionally refreshing and weather appropriate. My partner had the none alcoholic equivalent that had bitters in it and I have to admit that the one loaded with gin was slightly tastier. It’s a shame that they didn’t have something that represented a slightly more exciting mocktail, perhaps one with fruit juices in, especially as it would have been a fun thing to sip on such a warm day. 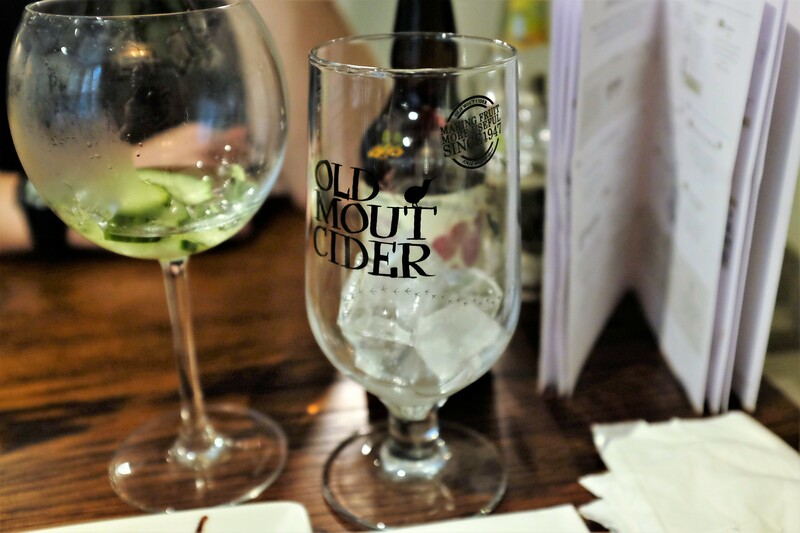 Later in the evening I opted for an Old Mout berries and cherries cider as I feeling fairly content at that point in time and wanted something cool and fruity before heading off home after a delightful meal. It coming with the suitable style of glass is a small thing that always makes me happy because I understand and appreciate the effort that drinks brands put in to finding the best shape to hold the flavours of a drink without bruising it. Another thing that I appreciated about The Fox stocking Old Mout Cider is that they had the berries and cherries cider in both the traditional 4% strength but also the 0.05% version so people could look to be drinking the same drink, enjoying the fruity flavours on offer, whilst actually enjoying an alcohol-free beverage. The starters were the absolute standouts of the meal. The selection on offer made it a pretty challenging decision to make but with the weather and the natural desire to have something that I am unlikely to cook at home I knew it had to be seafood. 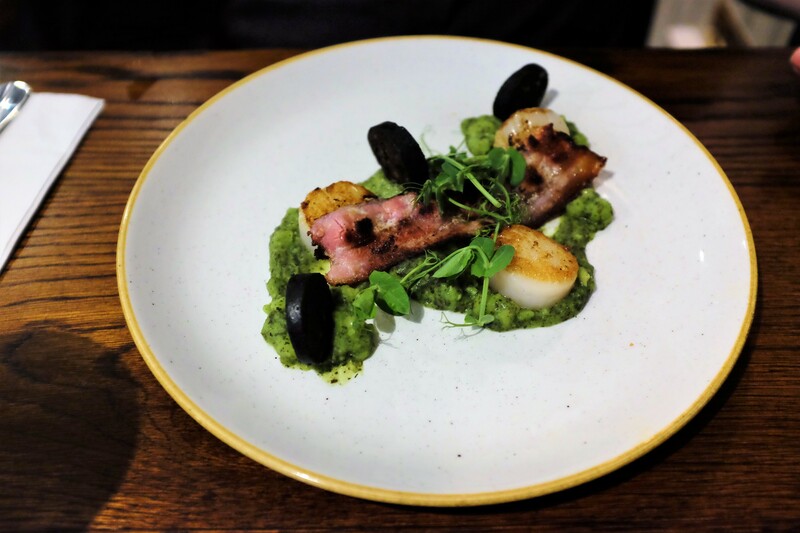 My choice was the “Salt & pepper calamari and tempura prawns on a crispy prawn cracker with chipotle mayonnaise” at £5.95 whilst my partner opted for the “black pearl scallops seared with black pudding served on minted pea puree with crispy bacon” for £7.95. As both the dishes arrived the presentation really struck me as it didn’t look like the usual style you think of for a chain pub or restaurant and I was immediately impressed. The aromas wafting up from my plate took me away for a second to being my a Spanish beach on a hot summer day tucking into a seafood pizza. From the very first bite I was in love. 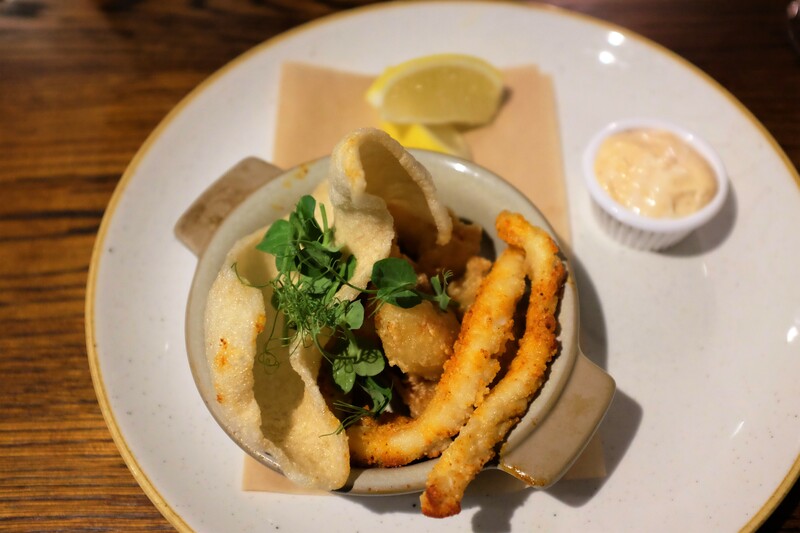 The calamari was seasoned incredibly with the mentioned salt and pepper but it felt like there was a little cayenne pepper in there to add an additional flavour depth and colour to the coating and the squid inside was cooked to melt in the mouth perfection. Each of the prawns were cooked exceptionally as well and the prawn cracker was a thick and carefully created piece that was loaded with flavour. Not a single bit of the dish was greasy and all the flavours fitted together like a glove to create this joyful fresh seafood flavour explosion in the mouth. It was some of the best seafood cooking I have encountered for some time. On asking my partner what he thought of his starter he said “this is how scallops are supposed to be cooked”. Now, I’ve never really encountered that many scallops as they are things that I know can be done well or go ow so very wrong but the ones I have had out and about never really do it for me. We did a little bit of a swap and I ate the bit of the scallop offered to me and now I know that all this time I have indeed been suffering from encountering people that don’t know how to cook scallops. This one was absolutely incredible and I could imagine how the flavour would sit merrily alongside the other ingredients on the dish, especially as I knew that they all worked as common combinations, that looked to have been cooked with extreme precision as well. I will admit that our choice of main meal may seem a little unusual given the reference to the weather but we hadn’t had a roast for a while and I find that almost any restaurant can pull off fish and chips or other similar pub foods so I wanted to give it a try. We opted to have the trio of meats to share and here they managed to provide me with a first. Individual dishes of vegetables, separate small gravy boats (which they will happily refill if you like your dinner lathered in gravy) and rectangle plates but in the middle was a large plate with all the contents spread across for you to serve yourself as much as you wanted. It looked like somebody had been let lose on a roast dinner buffet at Christmas time and I was pretty excited to get tucked in. Now the cooking of vegetables is always a bit of a sore subject. We all think back to that time there was nothing but vegetables left at school or when you had to select them as part of your dinner in the hospital and they were over-cooked, flavourless pieces of mush. The vegetables here were not at all like this and in fact they could not be more removed if you tried. The greens were cooked well and stayed warm in their dish, especially with the gravy on them, but the carrots were so variable in size that some were cooked and others were literally raw crunchy in the middle. My knife and those carrots did not get along and I had to use my fork to hold them before biting them apart. My partner seemed to have smaller carrots and said his were cooked perfectly so this is just one of those things where they need to keep a closer eye on produce size and account for it leading to different cooking times. But that’s me pulling this meal apart and thinking about every single element as the rest of the roast was delicious. The gravy was thick, not lumpy, full of flavour and had that lovely shine to it when poured. The potatoes were fluffy in the middle and yet lightly crispy on the outside. 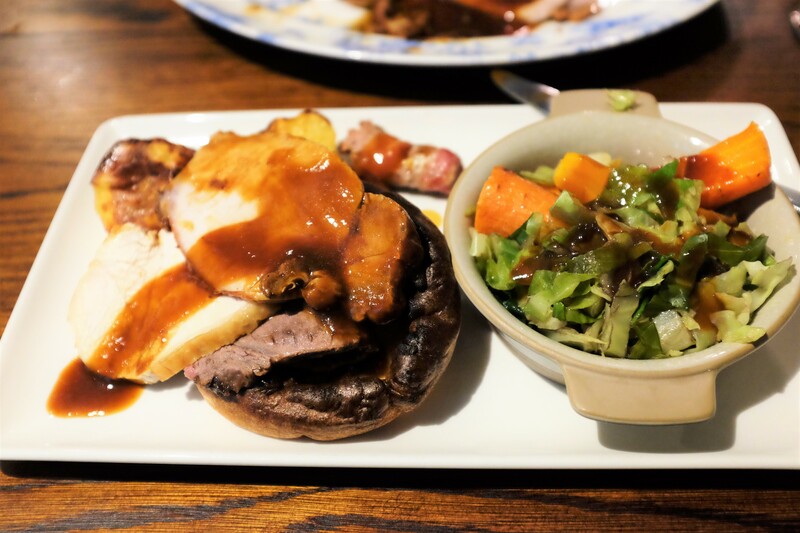 All three of the meats, beef, chicken and pork, were tender, moist and full of flavour. The pigs in blankets were properly wrapped up instead of having some sad bit of bacon scrap laid over it. The Yorkshire puddings were large and soft whilst being cooked through and well risen through. My only disappointment other than the vegetables was that I personally prefer my parsnips to crisp up a little bit more as they are one of the few things I find the flavour increases with during cooking time but acknowledge this is something different for each person. My partner was absolutely stuffed after his starter and main, something about a health kick which I fear has been prompted like so many things by the weather, so I was left to have a dessert alone. Luckily when it comes to desserts I have absolutely no shame in being the only one eating them and after eating this pudding. 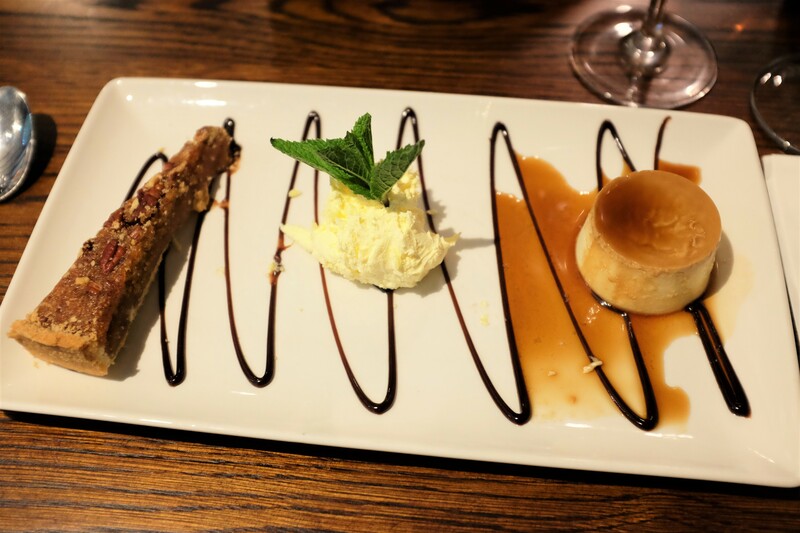 It turns out that on this particular Sunday I had a thing for trios and went for the “toffee & nut trio – treacle & pecan tart, crème caramel panna cotta and praline ice cream” but as you might see from the picture something doesn’t seem quite right. 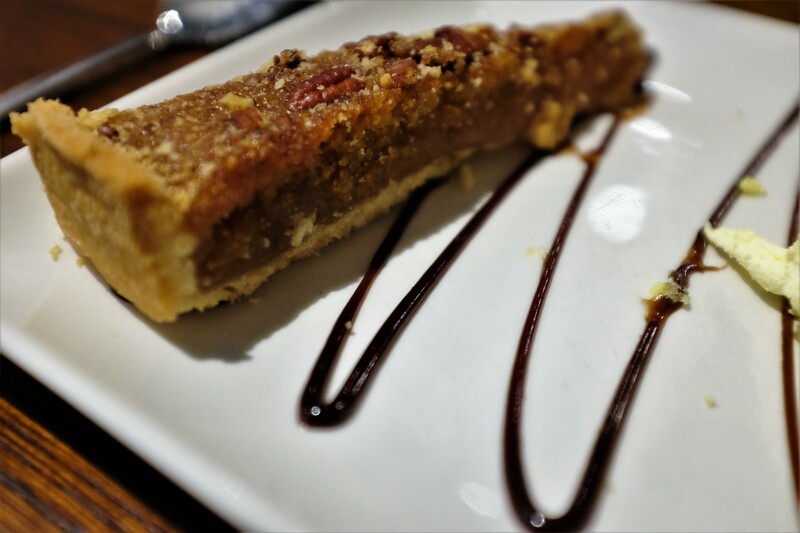 The treacle and pecan tart was deep in flavour, sticky and had a gentle pastry case that all combined made it rich and the perfectly sized slice on the plate. The panna cotta was smooth with the sauce being light and only mildly sweet to help offset all of the other flavours and reassured me again that they had a team of chefs behind closed doors that know how to put together food and how to cook them well. But you guessed it there seems to be some praline ice cream missing and instead just a splob of cream that had no praline or nuts or crunch or anything going on just some standard whipped cream. None of the waiters said that there wasn’t any of the ice cream available and I was surprised by the lack of even just normal ice cream in place of it but given I only realised after I scooped a large amount onto my tart to eat as a big scrummy mouthful I was a bit too confused to what had just happened to raise it at the time. I am sure there is some sort of explanation; perhaps they don’t have any ramekins that they could ice cream into to help it not melt on a warm day or that it was a trainee chef that simply overlooked the matter but I am surprised that it made it off the pass and through the waiter with no reference to the ice cream. 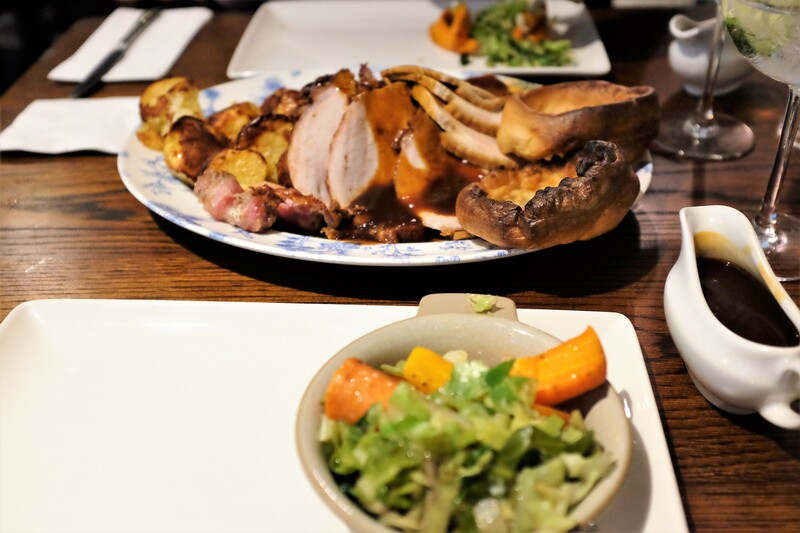 The staff all seemed friendly, informed and professional and this was evident in the layout of the restaurant and tables as well as their general attentiveness. A couple of the different duty managers came across for a chat, they switched shifts whilst we were there, and had a little chat about everything including the food, the refurbishment and the weather. It felt like it was a good vibe that welcomed regular visitors as well as the walker visiting on a one off to rest their feet and lubricate their throat. And where it was a busy Sunday it was clear that the odd thing had slipped in terms of overall quality. At the end of the meal just before leaving I headed into the toilets and found toilet roll scattered across the floor with no actually toilet roll in any of the holders. This could have recently happened and nobody had alerted staff to it or they had recently done a cleaning check and they missed the even by moments but there was no way to tell. The toilets themselves were well designed and presentable and compared to the rest of the place the mess seemed rather out of place and that somewhat made it feel more disappointing than usual because I know the standards they are clearly setting out to achieve. It is certainly somewhere that I would go to again, take other people with me for a meal there or recommend to people wanting to get just a little out of town to enjoy a countryside-esque feel and be able to admire nature as well. *Invited to The Fox at Coulsdon Common by Spotty Dog Communications. PR offered money off the bill in return for an honest review. This entry was posted in Food and Drink, Restaurant Reviews and tagged alcohol, calamari, Coulsdon Common, croydon, dessert, dinner, drinks, evening out, food, food blog, food blogger, food bloggers, food review, lblog, lblogger, lbloggers, life, Lifestyle, lifestyle blog, lifestyle blogger, lifestyle bloggers, London, main, meal out, Pr, prawns, pub, restaurant, Restaurant review, review, scallops, seafood, starter, Sunday dinner, sunday lunch, The Fox, three course dinner, three course meal, Vintage Inns. Bookmark the permalink.